Home / Columnists/ Ven. Athuraliye Rathana Thero on a collision path with Govt. Ven. Athuraliye Rathana Thero on a collision path with Govt. MP Ven. 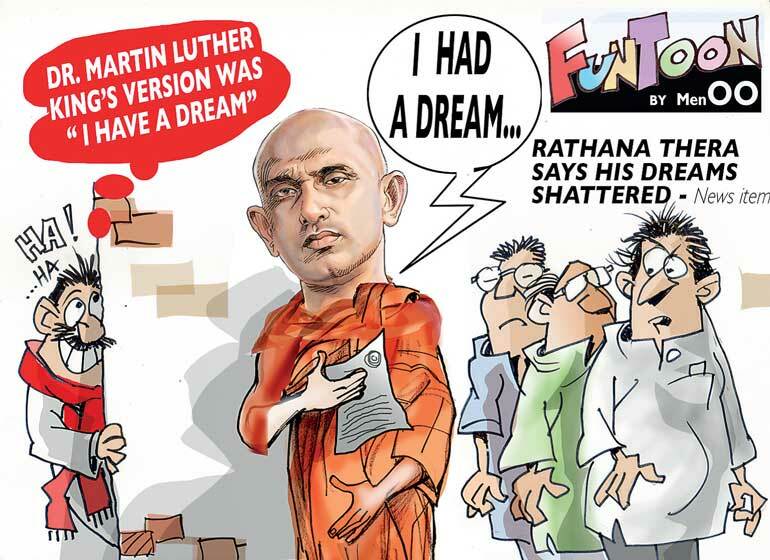 Athuraliye Rathana Thero, a key architect of the 8 January revolution, said his dreams to get good and valuable things done from the present Government were shattered and he is now left with only one dream, and that is to prevent the Government from at least making any harmful decisions. The Thero expressed these views during a news conference organised by the National Council of Sri Lanka (NCSL) in Colombo over the detrimental conditions of the proposed China-Sri Lanka Free Trade Agreement (CSLFTA). “As of this moment, my hope is not to get good things done from this Government. Those dreams of ours had been shattered. Now our dream is to prevent the Government from making detrimental moves. After electing the Government into power, we know that not only the Cabinet but we too have a responsibility” – Ven. Athuraliye Rathana Thero, quite silent and almost a non-factor in the public domain for almost a year, made the headlines of all media this week with this explosive statement. Though he has been unceremoniously evicted from the Jathika Hela Urumaya and remains a National List MP of the United National Party (UNP), it is no secret that he does not identify with that party. Although very close to President Maithripala Sirisena, he has no truck with the Sri Lanka Freedom Party or any other party. What happens from now on from the Thero’s side, no one knows. Some insights into the Thero’s character, going by his history of declaring war against the former President in 2014 for bad governance, might help to infuse some thought into his conduct and therefore should not be taken lightly by the Government. The Thero singlehandedly pushed the JHU out of the coalition led by Mahinda Rajapaksa in late 2014 and this move created the space for the consideration of an alternative like the Maithripala Sirisena candidacy. Whether or not we will see the Thero doing another ‘move’ after August we cannot predict. Neither can we predict the kind of arrangement that might result if there is such an eventuality. On 8 January nearly 54% of our people voted for a new President and for a new Government with a mandate to establish the rule of law, to eradicate bribery and corruption and establish good governance. However 30 months after the Yahapalana Government, was elected there is a growing concern among the people who silently came forward to usher in the silent revolution as to whether their aspirations are being met fully or will ever be met. The appointments of people to key posts with no respect for merit and competence and not dealing with poor performance in many State institutions does not augur well for the Yahapalana Government and can only strengthen the hands of the Opposition and justifies their rhetoric. Maithripala Sirisena, with the support of Ranil Wickremesinghe’s UNP, the country’s largest political party, won the election on the promise of ‘Yahapalanaya’ or good governance, essentially to reverse what was so blatantly going on. The then Opposition therefore campaigned vigorously against corruption, accusing the Rajapaksa Government of siphoning off funds for their own family and leading the country to a future of international isolation and economic insolvency. Based on Sirisena’s campaign manifesto, the first order of priority was clearly the promised anti-corruption probes, cancellation of suspected sweetheart deals and a review of Sri Lanka’s foreign indebtedness—particularly to China, which had become a major provider of economic assistance and investment in recent years. The next priority of the Sirisena Government was, more specifically “compassionate” governance—seeking to restore the balance, vis-à-vis the responsibilities divided between Parliament and the presidency, scaling back the accrued powers of the presidency and tackling nepotism. Sirisena’s campaign promise was to focus on restoring Sri Lanka’s international image as well as strengthening its “cordial relations with India, China, Pakistan and Japan” and other important Asian partners (Thailand, Indonesia and the Republic of Korea). The campaign manifesto promised to improve relations with India, “with an approach that would be neither anti-Indian nor dependent”. The manifesto speaks only of taking a “humanitarian” approach to the human rights question and a less-defiantly defensive approach to the difficult national question of ethnic reconciliation. Other than the passing of the 19th Amendment to the Constitution, an outstanding moment in our history, and the regaining of GSP+, there has been more rhetoric than results and sometimes a compromising of many of the good governance principles. In Sri Lanka, like most other South Asian countries, history has a tendency of repeating itself. Therefore, our only hope is that those entrusted with political power would live up to the people’s expectations and demonstrate their commitment to the true values of Yahapalanaya. The time has come, as the President himself once said to those who accomplished the November revolution, that they must also be ready to defeat a counter-revolution if required to ensure the promised Yahapalanaya does not get buried. The window of opportunity to reform our political culture and managing the painful economic reform in an equitable manner still rests with the President and the Prime Minister, two men who have an outstanding ability to do good for the country and restore Sri Lanka to its rightful place in the world once more, if not they will leave their followers stranded high and dry.